Perfect for the everyday operations of any restaurant, this mid-sized bus box is an effective and efficient way to transport goods from the table back to the kitchen. This versatile gray bus tub measures 20" x 15" x 5" and boasts durable plastic construction built to carry even the heaviest of dinnerware. Nice little shallow bus tub. We use it for silverware. I really have no complaints about this product and hope you will also enjoy it. Recently I had to buy a few more of these. I just bought what the store down the street has and they are not as good of quality as the ones on WebstaurantStore. I should have just waited. The new ones are really thin and flimsy on the bottom. The ones from WebstaurantStore are much more heavy duty! Stick with these it does make a difference! This is a very well made product. Make sure it easy to transport items or great for using as a storage receptacle. Great price also. 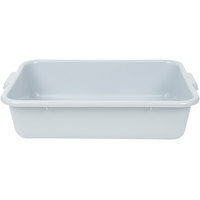 For the price, the 20" x 15" x 5" Gray Polyethylene Plastic Bus Tub, Bus Box is a great buy. The quality is noticeably not as superior as the more expensive Carlisle tub I have. The sides bend/give easily if pushed. I am not fully confident that it will not crack over time if pushed up against as an organizer in my vehicle's trunk. Man has my life improved because of this tub. I am better because of it. It's sturdy, sleek and best of all, holds up to the beating it takes in the restaurant. The 20" x 15" x 5" Gray Polyethylene Plastic Bus Tub works really well for toy storage in our toy room. The quality is very good as it is heavy duty. I highly recommend and would definitely purchase again if needed. Very useful to have around the kitchen and brewery. Have used them to hold dirty stainless steel brewery parts, dishes, and even to store cold beer on a table for an event. No issues with leaking. They are sturdy and functional. this is a nice heavy duty tub that is great for busing dishes. we keep it under our counter for smallwares like plates and frothing pitchers. There are so many uses for these, I will be using the colors to help keep alike things or alike uses of equipment/utensils. These are going to help greatly! I have a dish drying rack only slightly smaller than this and this fits perfectly underneath to catch the dripping water. Its certainly durable enough for my uses. Great low cost bus tubes. They are not as thick as more expensive ones but they are about half the price. Lids which are not included fit well be do not lock that might be a plus depending on the useage. They are NFS listed made from HDPE #2 plastic. They are made in China but for the price it is what you can expect. Perfect plastic grey tube! Makes it easier to carry items such as veggies, or cleaning up dishes! Recommend these to anyone who wants life easier! Good price for the product. I purchased three and are still using them. They do crack quickly so don't over fill them. I would recommend them for only light duty use. I wish I had bought these a long time ago. I live in the church parish house and often host events for 10-40 people. Even though I have a decent sized kitchen, clean up was always a bit difficult dealing with the dirty dishes. People wanting to be helpful would bring the dirty dishes into the kitchen and fill the sinks and counters with dirty dishes and glasses. Now, with three tubs I am able to have one for dishes, one for glasses/cups and one for silverware. This allows for a much more orderly clean up for me in as much as I can more easily scrap/rinse plates and load the dishwasher as I see fit as opposed to which pile I need to move to make room on the counter for more incoming dirty dishes. Even if you live in an apartment and only do one or two dinner parties a year, this is definitely worth keeping on top of your cabinet at the ready. Cost effective way to store our food items. When paired with the matching lids, they will stack and save lots of space in the cooler, and when not in use, the nest to stack for storage. I use these 2 bus tubs right in my kitchen. I have 2 locations where I keep food so I use one to gather what I need before I start preparing my recipes. I do use the other one to clear the table then take over to the kitchen and load the dishwasher. It's so quick to take a clean washcloth over to the table, clear the dishes, wipe the table and wisk it all away. Either when entertaining or even on a family dinner night. A quick, easy efficient way to clean up. I do like this bus box to lay out my food before I cook, it is large enough to lay out my food and really see my ingredients. These are so helpful. These bus tubs are great. So great that I bought a couple more because the employees complained about not being able to find empty ones in the store. These are the employees' favorite bus tubs. Surprisingly, those employees don't wash them out even though they are very easy to clean and keep clean. They are sturdy and practical for my use in the resturant. If they were a little deeper work better. Will buy some more in the future. Love how easy it is for these to stack, simple to clean, does the job like it's meant for, durable and stands up strong to abuse. These tubs are great and the price compared to the big box stores are great we purchased four of these and use for the draining of dishes, fits the cart too. Excellent tub for its sturdyness as well as easy storing. The stacking ability helps us keep the place organized and we have one single pi;le of these for our whole restaurant. Thank you Webstaurant for a great bus tub with a great price. We bought two just to try them out and will be ordering more soon. We prep a variety of salads and this is the perfect size box for us. The fact that they are 5 inches deep is perfect for us because we are ablr to stack afew on top of each other on the fridge shelf and utilize our space better. The heavyweight plastic is very durable and washes easily. Great Bus Tubs, light weight & very versatile. I use them for all sorts of things from storing items in them to putting water in them to clean utensils at events when water is not accessible. Can't bet the price!!! Couldn't ask for anything more in a bus tub. It is lightweight and has a nice gloss black finish so I don't mind leaving it out for customers to bus their own tables. Can't beat the price either! These bus boxes are the perfect addition to our processing business. They are durable and inexpensive enough to buy in bulk. I think we have about 40-50 of these in the store. We love these bus tubs for all sorts of meats, and prepped items. They are great to stack in our coolers when paired with the lids. A Great quality bus Tub for an Awesome price. Buy the lids and multiple colors great for sorting and storing anything including food, napkins, silverware. The bus tub is lightweight but sturdy. Easy to pick up and move around to collect dirty dishes and bring them back to the dishroom. Love these tubs! We use them with and without a lid. With the lid, they stack great and are a good size for all those odd or small items. This is a excellent product. I have been using these tubs to house rodents. Even mice won't chew out! I have also use this to house African Soft Furred Rats without any problems. Great multi use tubs, I buy some for food prep and storage and we also purchase the covers, makes it great for prepped food cooler storage. Great price. Excellent color. Fits well with the lid. Has a lot of room. Sturdy, stable, reliable. Will be ordering some more for utensils and such. We use bus tubs for many applications in our operation from storage to mixing to transporting heavy goods. These are sturdy and well-made, and very affordable. this bus tub made high quality and commercial usage. very strong. we use it for bus tables, stock lettuce, ect. none is broken yet for 1 year. the 20x15x5 black bus tubs are very sturdy and light weight. The tubs are easy to clean and will last the beating when transporting food to a job. This bus tub is great not only for dishes but great for useful kitchen projects too! Its ideal for storing seafood on ice, Just flip a sheet pan upside down, place inside and add ice! 1/3rd pans fit perfectly inside with ice surrounding! It came exactly as the product description was described. It is durable, easy to clean, and can do a number of things from putting dirty dishes in to storing things. these tubs are great. They work perfectly for our needs. They are well constructed and a great price compared to other suppliers. Shipping costs were reasonable. Very good product at an economical price. This is a sturdy box. Also purchased matching lid and both are holding up well with daily use. Nice weight, easy to carry. This is a basic bus tub that seems like it will hold up to years of use. I wish there was one that was a little deeper and fit the same lid. We are using these pans for greenhouse produce delivery to local restaurants. We love them- easy to clean & handle & they fit well in the commercial refrigerators. These don't bust when kicked around. They also fit well into commercial dishwashers. Lightweight, but also strong. I also like the low price on this item! Being a thrifty mid-western girl I typically would not spend the extra for black bus bins, but this proved worth the investment. As our food bins are now the gray and buss bins are black. We used to try to label them, but this is much better. Nice product. Holding up well. Sturdy, light weight and easy to clean.